This is a photograph that I took yesterday during a walk near Independence Park here in Beverly, MA. 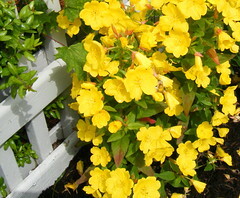 I saw these yellow flowers and I liked the way they looked against the white fence, so I got out my digital camera. The sun was out (briefly) which is reason enough to take a picture these days! Tonight I cropped the photograph to get this composition. I think the yellow flowers might be buttercups.